This purely Chinese, traditional, linear style, where the entire painting rests on its calligraphic line and the colouring is almost incidental, is extremely rare on palace enamels on metal and glass. If you mentally remove the colours and ink-washes from a traditional Chinese painting, you will usually end up with a still-coherent scene, as you would here; if you do that with the majority of palace enamels on metal and glass, the scene would be incomplete. 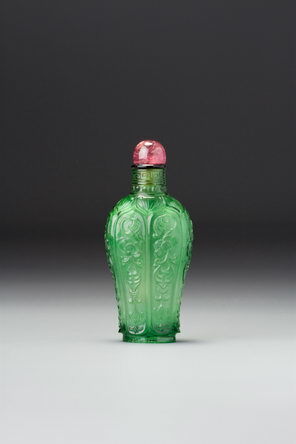 One of the few enamelled glass bottles from the palace that relates to the present example in terms of the brushwork is the one from the Blücher Collection (Moss 1971a, no. 270). 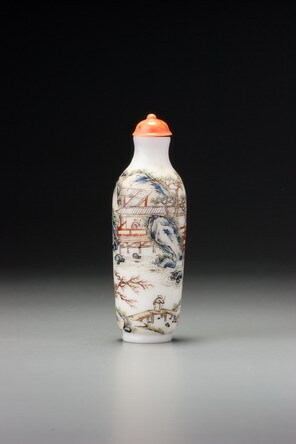 It is a small, Qianlong-marked bottle that probably dates from the mid-reign and is painted entirely in Chinese style without any hint of European influence. Because of this, it has, over the years, been somewhat overlooked.